AEDs have the programming in them to tell when the heart rhythm is something they can help with. Its pretty much a coin toss whether or not an AED will help. Even knowing it’s not a shockable rhythm is useful info for the first responders once they get there. Full up defibrillators like what is used in the hospital can be used to restart an non-beating heart, it’s what we use in our Operating Rooms for open heart surgeries that they have stopped the heart completely. The operator needs to know how, when, and how much energy in those situations to successfully resteart the heart, which is why an AED can’t be used. From the title I have visions of flying robots with dangling paddles going around randomly shocking people. heh. Wrong website dear boy. I’m reminded of those video games where defibrillator paddles can be used as a weapon. Every where I’ve worked in the last 10 years we’ve had AED in all places, We all have FA. Yeah, in my country there have been campaigns to install these in all kinds of places, specially malls and sport facilities. In the UK as rural payphone boxes go out of service they are often being reused for installing AED devices into. Our church got one and we had a lot of people take the training. The local fire/paramedic showed up to give us an overview and told us some local takes of people being saved (heh) because an AED was nearby. They’re generally easy to use even if you don’t have training. I think the one we have has voice prompts and diagrams to tell you what to do. Getting more people to volunteer for training may be just the ticket to getting one installed! Thanks! So, there are effectively four kinds of ‘cardiac arrest rhythm’ – PEA (pulseless electrical activity), Asystole (no electrical or mechanical activity), Ventricular fibrillation (twitching heart muscle, disordered electrical activity), ventricular tachycardia – too fast, sometimes no useful output because no time for the ventricles to fill. VF/VT are shockable, and have the best survival rates. PEA/asystole – often bad (worse.!). e.g. major haemorrhage will usually lead to PEA – heart rhythm might be OK, but no useful output because there’s no blood coming into it to circulate. I’m a little uncomfortable with the wording against CPR here. Yes, time is the issue, but you made it sound as though you think that CPR is useless, so why even bother? When it comes down to it, oxygen is what is necessary. Without O2, in a matter of minutes the brain will be irreparably damaged. CPR is not meant to bring a person back to life, it’s meant to keep their brain alive until help arrives. An AED is a big help in getting the heart to pump, but once you’ve put that on someone, you’d better keep giving rescue breaths add you were trained; pumping blood is useless unless there’s oxygen in it. Always remember: CPR is not for bringing people back to life, it’s for keeping their brain alive until help arrives. I’m also uncomfortable with the wording. The article claims success is ‘vanishingly rare’, which indicates a terrible understanding of the statistics. Yes, most times when CPR is administered, the person still dies. But there’s more to the story. In cases where CPR is administered, 2 to 3 times as many people survive. Doubling the chances of survival after a cardiac event? That’s awesome, especially for a tool that can be used by people with minimal training, without any equipment, and with little or no downside. TL;DR Don’t let the article mislead you, it’s worth doing CPR. Misleading is putting it mildly… Particularly the implication that CPR is only for use in cases of cardiac arrest. If you need to do CPR, the patient is already dead. You can’t kill them. And yes, CPR alone can save a life. But it is rare. AED can save a life, but it isn’t what I would call altogether common. Any yes, I’ve done both. 3 AED reversals in maybe a couple dozen uses. Better odds than being assumed dead. But not great. Rescue breaths are unnecessary for the short time it takes first responders to arrive. Simply doing chest compressions, to the proper depth, provides enough airflow to the lungs. The main goal in any case is to start medical intervention as soon as possible. I’m pretty sure I don’t believe that; besides, once the AED is on you should not be doing chest compressions any more. If the patient is no longer breathing, the bloodstream will run out of O2 very quickly. On top of that, many times when CPR is needed you and the patient are far enough away from emergency services that first responder response is not really a short time–more like half an hour to an hour in some cases. I’d like to see some backup research showing that a proper chest compression gives any meaningful lung inflation to a patient before trusting this claim. It just doesn’t strike me as correct, coming from someone who maintains a current Professional First Responder FA/CPR/AED training and is certified as a Rescue Diver. Hands only CPR is recommended by every major heart association, the red cross and many medical services.The studies are all there for your review, all you have to do is pick a heart association or search hands/compression only CPR. Though it must be said there’s questions about whether it works in children, I presume due to unfused growth plates. Your blood has a lot of oxygen in it already, you’re unconscious and unmoving so the amount required to keep the brain active is low, and as I stated chest compressions circulate enough air to avoid brain damage. Compression-only CPR does work, but only for a very specific type of cardiac arrest: Witnessed SCA of an adult or adolescent. Physiologically speaking, CPR with rescue breaths is better overall. In some circumstances, compression-only CPR is not recommended. Compression only CPR: better than nothing. Really only effective if you watch someone go into cardiac arrest. Rescue Breathing CPR: always a better alternative if you are trained. And that’s the key: you should get some actual training. To pass the Red Cross CPR course, you learn CPR *with rescue breaths* because it’s the better method. Really; do yourself a favor, and go take the class. If it’s been a couple of years or more, go take it again. CPR is something everyone should become proficient in doing. That’s not something that’s been taught on any first aid course I’ve ever been on. AEDs check the state of the casualty’s heart about once every couple of minutes, and you shouldn’t be doing chest compressions during that check (because they’ll queer the measurements), but any modern unit will warn you when it’s checking and tell you to stop. The rest of the time… between AED checks, your chest compressions are all that’s aiding the casualty. Don’t. Stop. Many AEDs when I was first trained would advise you when to start and stop compressions. That seems to have changed somewhat in the last 15 years. Took my CPR class a few weeks ago and the AED we used no longer does that. Change in protocol. Happens. I’ve had to do both. It’s rather hard to be three handed in doing CPR, breathing, and dealing with 911, while under stress. But it beats the alternative. Thank you for stepping in when needed. 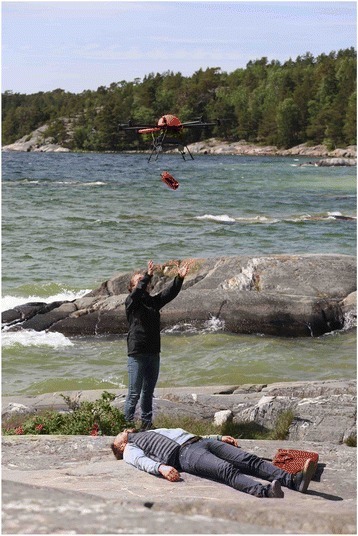 I expect to see many UAVs for medical care in the near future. Something as simple as a first aid kit and a bottle of water could save someone who has fallen while on a hiking trail. I’m not sure I agree about the ‘overwhelmed by emotions’ part, but it is easy to become flustered and/or confused when surrounded by a crowd of people all talking at you at once. Clear instructions and talking ‘idiot guides’ are no substitutes for proper training even if you’re not trying to read or follow them while in that situation. Has the price gone down? Generic epinephrine autoinjectors are available for $10 in U.S. pharmacies. A flying epipen would be – a drone mounted dart gun. Good luck getting that approved. As for a drone defibrillator: You need one that lands on the patient, then takes over the entire CPR cycle. I’m not sure how I’d feel about watching a drone, attaching itself to an unconscious body, inserting a tube down the throat, “hugging” the body to ensure sensors detect heart activity, etc. It would have been weird in the 1800s to see someone performing mouth-to-mouth and chest compressions. It would have been weird before the 1950s to see someone placing paddles on someone’s chest and giving a defibrillating shock. In 2017 it’d be weird to see a CPR drone, but it’s only weird until it’s not. If it saves lives, we’ll get over the weirdness. you can imagine flying systems that could run instant tests, diagnose and medicate, even perform surgery. if there’s enough coms link available, it could all be under remote control or supervision. In the future everybody will probably have biological monitors built in to them anyway, and the drone or whatever will already have a good idea what is wrong before it even arrives (which might even be before the person actually has a heart attack). Shooting darts and landing drones on patients are very high risk actions. Delivering medical supplies and a telepresent nurse is much safer, easier, and likely more effective. ^this^ I am sure the special effects crew from the “Alien” movies will gladly help with the design of the exterior! Where I live/work we need flying Narcan (naloxone). I was in a McDonald’s restaurant this past Spring when an O.D. was found in the Men’s Room. CPR performed by trained personal helps save lives all the time. Just ask a firefighter or a professional lifeguard. There are many success that go unreported, but a death almost always gets reported. In my opinion, this is some kind of inversion of survivorship bias. CPR attempted by someone who watched a how-to video online instead of taking a training session with a medical dummy, well that doesn’t usually help anyone. I should have been clearer in my generalization of CPR’s ineffectiveness. For witnessed cardiac arrest caused by something other than heart disease, like drowning or electrocution, CPR is really effective. But it’s far more common that CPR is performed after cardiac arrest secondary to some kind of heart disease, or as a result of some other disease process. In those cases, no matter how quickly effective CPR is initiated, the end result is likely to be disappointing. That’s been my experience anyway. And I never said or implied not to learn CPR. I was an AHA-certified CPR Instructor for years and can still lay down a perfect 20-minute strip on a recording mannequin like I did when I was certified. CPR is a life skill that everyone should have, but you need to have reasonable expectations on what it can achieve. Saving the life of a choking baby or a drowned kid? You bet. Aunt Franny who ate fried chicken day and night for 70 years and dropped at the family picnic? Probably not. I hope CPR training becomes more commonplace worldwide, and medical drones of some sort will definitely be a common reality soon. Drones are not allowed to fly in areas where such a system would be more likely to be needed. Having them defibs in businesses etc. basically all publicly accessible buildings, would work better, you just manage the location and access problems with a free phone app and or emergency services could simply send you the data to your phone when they called you, including the unlock code for the nearest locker. Because you do need to call them anyway, obviously. This solution may be faster than drones in most cases anyway. For more remote locations the drones have the problem of range and speed so a manned helicopter works better. That does not leave much in the way of areas where such a drone is the best solution, perhaps thin bands around the edges of population centres? Why not just have them always roaming in the skies above crowded areas where incidents are most likely to occur? Then when it gets low on battery, the next drone comes to take it’s place. That way you are 30 seconds away all the time, rather than 30 minutes. Yeah I suppose you increase the wear and tear, and use electricity faster that way, but isn’t it probably worth it? And if the issue is that people don’t want it to be buzzing around their heads all the time, you could just land it somewhere and save battery. People would obviously need to give permission for it to perch on their roof or somewhere, but I would doubt most people would care. You could even have the drone perform the defibrillation on it’s own. The only thing the person would need to do is give the drone permission and probably open the person’s shirt. Yeah, let’s have heavy drones flying over crowds of people, what could possibly go wrong? Your idea of a medic patrol makes sense. Even now when we still don’t have medical help drones, we could have roaming paramedics’ vehicles “on the beat”, patrolling cities and remote places which have elevated probability of medical emergency. CPR is about buying time until people with the right medical qualifications can give proper treatment. Twice I’ve had to do it. Twice I’ve had a magic AED with me. Only the application of adrenaline has helped the situation which has been applied by a paramedic (UK). I kept each of them going for the 10 minutes required for the paramedic to get to them. One died, one made a recovery before a stroke KO’d them, but that one got a chance to say goodbye to their family. I have made three saves as a paramedic in 15 years, all were conscious patients already loaded into the ambulance entering v-fib and crashing as I watched. I think in all cases I had to do the 200j 300j 360j stacked shocks and give epi IV to turn it around. I would always give a precordial thump and CPR a try but the odds are so damn low, mine were already on the monitor and had a good dripping IV in, I think one also had an ET tube in, for the others the stuff was obviously within arms reach and I was at the head seat where the work was easy and in one case had an intern or volunteer in back to help with stuff like conductive gel for the paddles and unboxing and assembling the drug preloads. No doubt AEDs save lives, as does having a modern advanced both ambulance crew and two on every firetruck paramedics(who have several years of specialized training and now often a degree), just not that many for the amount they are called. But when you have a cardiac arrest a paramedic or a doctor for that matter who has no more magic than a paramedic when following the ACLS protocol for treating a cardiac arrest, the odds are not great even if the ECG/defibrilator and IV are already in. It is worth scientific study but I doubt the range of a drone will make a big difference except in a mall or convention center. I also think that for a small extra price an in-date IV bag, epi, and lidocaine, a laryngoscope, oxygen, and et tubes could be co-located with the AED(maybe with ACLS qualified manual shock override code) for off duty paramedics and doctors with the correct qualifications to use. I would feel naked trying to run a code with only an AED firing when it wanted, a bag-valve-mask delivering ambient air, and chest compressions. How long is that compression only technique good for? Considering it takes at least 20-30 minutes for an ambulance to get where I live (we’re 2.8 miles from the regional hospital) is there enough O2 in the bloodstream to prevent brain damage?